Looking for a nifty SEO tool to help you with link building? Try LinkAssistant - industry's unmatched link management leader. Use it to find thousands of high-PR sites in your niche (6 methods of partner search! ), create and dispatch hundreds of link partnership offers, build an eye-pleasing link directory, track links placed to your site and verify them at any time you need. Why wait? Try this leading-edge link building tool for FREE today! Build thousands of links to your site at ease - go LinkAssistant, a #1 SEO tool! -It takes LinkAssistant minutes to find you thousands of niche-related websites (using 6 different methods of link partner search) to get links from. -With LinkAssistant SEO Software, preparing and bulk-sending hundreds of link exchange offers is just a mouse-click away! -Use LinkAssistant SEO Software to create a sleek link directory for your site that perfectly matches its design. 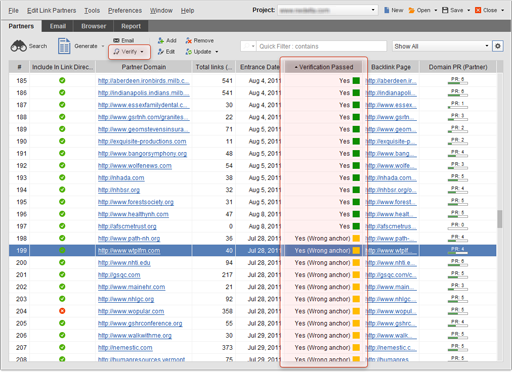 Once you're finished, you can easily upload it to you server right from inside the SEO tool. -When partners start putting links to your site, LinkAssistant helps you stay on top of things. Verify links to your site at any time you'd like. Detect missing, nofollow links and links restricted from indexing with a robots.txt file. -Add/delete link partners on the fly, assign them statuses and what not! Moreover, LinkAssistant is geared with advanced search safety mechanisms that ensure its smooth operation at all times. Optimize and Promote your website incredibly easy with WebLink SEO. 1099 Software for preparing, printing and E-filing 1099 forms and W2 Forms. Software Tracker is a useful tool that helps you manage all software well. Software sales toolbar for Internet Explorer. Submit your software to 325 sites! pdc Software Submit the program designed for developers. Qweas is providing links to LinkAssistant SEO Software 4.08 as a courtesy, and makes no representations regarding LinkAssistant SEO Software or any other applications or any information related thereto. Any questions, complaints or claims regarding this application LinkAssistant SEO Software 4.08 must be directed to the appropriate software vendor. You may click the publisher link of LinkAssistant SEO Software on the top of this page to get more details about the vendor.